Sales of recorded classical music are an important measure of the health of the art form. Yet, despite this, there is a paucity of informed and objective commentary on the sales trends. Instead industry commentators such as Norman Lebrecht offer quick and dirty comments such as: "Pierre-Laurent Aimard’s Bach on DG follows with 211 sales... that’s in the whole of the US market of 314 million people". Predictably, Alex Ross offers a more level-headed commentary in his New Yorker article The Classical Cloud, but it strikes me that some background data would usefully complement coverage of classical music sales elsewhere. So this post presents an objective analysis using data for the US market, in an attempt to separate fact from fiction. In the US total album sales - all genres - increased by 7.7% from 2012 to 2013. This category of 'total album sales' includes physical product, downloads and streamed content from outlets such as Spotify, with streamed tracks converted to 'track equivalent albums' by applying a ratio of ten tracks per album. The overall increase of 7.7% was the result of three conflicting trends. First, there was a massive 32% increase in streamed music tracks. Secondly, sales of digital tracks dropped by 6%, and, finally, sales of physical product (CDs etc) dropped by 13%. In 2013 118 billion music tracks were accessed by paid-for streaming in the US. If a ratio of ten tracks per album is applied, this equates to 12 billion albums. In the same period 289 million albums (physical and downloads) were purchased. Even allowing for errors in converting streamed tracks to album equivalent, these figures show the astonishing (frightening?) dominance of streamed over dowload/CD music consumption. But the figures also show the danger of guaging the health of classical music sales by the weekly sales of physical/downloaded albums: because, even allowing for the smaller participation of classical on digital platforms - see below - unit album sales are now an unreliable measure of the health of classical music. No data is available to me for classical as a percentage of streamed music. But available data does show that classical represents 0.5% of digital track sales. If this figure is modified to acknowledge the fewer tracks on a classical album (uplift 0.5% by 2), classical music is under-performing quite badly in digital downloads and only achieving approx 1% of total sales, a trend that is likely to be mirrored in the streamed market. By comparison classical is achieving 4.9% of CD sales, a figure that has held up remarkably well for decades despite repeated predictions of the death of classical music. Trends within the different access platforms are illuminating. As already highlighted, across all genres streaming is the ascendant star with a 32% year on year increase, while yesterday's star of downloads showed a 6% decline, and CDs and other physical formats declined by 13% decline. Physical product sales outnumber downloads, with CDs and other formats accounting for 57% of the non-streamed market. 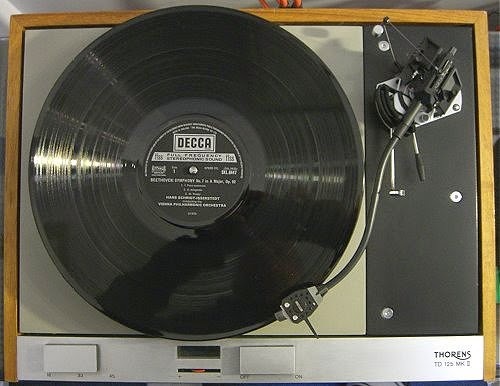 There has been much hype surrounding the revival of the vinyl market, but this is supported by market data which showed vinyl sales growing in the US by 33% from 2012 to 2013, and accounting for a remarkable 3.5% of total physical format unit sales. The analysis above has been produced using data for the US market that is in the public domain. I did end my career working for Nielsen, whose SoundScan data is used in this post. But I have had no professional connection with Nielsen for years and no access to privileged data. This post has been compiled by a retired guy living in rural Norfolk, because there is a shortage of objective data on this subject. If the professional analysts know better please tell me, and I will publish corrections. All the commentary above attempts to be objective, and to it I would add the following subjective commentary. Downloading is a spent force in the music market; CDs are also in decline, but they retain the larger share of the non-streamed market. Classical music under-performs in the digital domains but remains strong in the CD sector. This, again, emphasises that the markets for classical and rock music are fundamentally different, and trying to force classical into the rock model - the Max Hole fallacy - is foolhardy. For this reason, attempts by the major record companies to write off the CD format to suit their own commercial agendas should be resisted, simply because classical does not currently have a strong enough digital franchise to survive. But the trends in downloaded and physical formats are completely overshadowed by the huge growth in streamed music. Classical musicians, whose livelihood depend at least in part on the health of the recorded music market, have shown remarkable little interest in the potential impact of the massive growth of streamed music. Whereas prominent rock musicians - as Alex Ross points out in his article - have raised the question of can music survive in the streamed era? The exorcising of three minutes of Harrison Birtwistle from a BBC Prom TV broadcast, which is currently generating much attention, is calamitous. But the inexorable rise of streamed classical music with the associated introduction of a totally different business model, could be livelihood threatening. Is classical music fighting the right fight? Header photos shows my trusty Thorens TD125 Mk II/SME Series IIIS/Audio-Technica AT-F3 turntable set-up - vinyl sales up 33% - and comes from Beethoven pure and simple. Any copyrighted material is included as "fair use", for the purpose of critical analysis only, and will be removed at the request of copyright owner(s). Also on Facebook and Twitter. Bob, there is part of that Guardian article that is of the sort that makes one think of giving up. The anonymous BBC spokesperson says that the Proms team and commissioning editor (whatever that means) have to bear in mind the audience and that "newer works are often less familiar to them". Had she said such works are less accessible/appealing/etc. to them, her words would simply reveal an ignorant assumption, and a majestically arrogant one. But to say they are "less familiar" when defending the failure to broadcast them is just inane. If "commissioning editor" means the person who commissioned a new work, the participation of that person in the decision not to broadcast said work moves us closer to the surreal. Norman Lebrecht's blog is in its entirety as much surrealism as we can put up with in all this. For a "retired guy living in rural Norfolk", you've done an extraordinary job of making sense of the numbers -- that Nielsen background is paying off for us. Thank you very much for this analysis, and particularly the emphasis on streaming. Although much blame has been placed on the major streaming outlets (esp Pandora) for carrying such a limited offering of classical music, I suspect you've hit upon another essential dilemma: artists and audiences don't seem to be courting them, either. They need to hear far more from our corners of the universe, so they understand that we're part of the market. Perhaps it's just too intimidating for some individuals, but classical creators and listeners must take an active role in encouraging Pandora, Spotify, Last.fm and others to include more classical and esp. more new music in the mix. It must be accessible to have any shot at familiarity. We can get in touch with any of these companies through their websites. Don't give up -- as you said, we must fight the right fight! Hi Bob. Love the post, and I love that you're bringing in some specific numbers. However, I wanted to point out in case some in your audience don't know, there is a difference between "track equivalent albums" and "stream equivalent albums." TEA is for downloads where ten track sales equal one record sale. SEA is for streams (duh) of individual tracks. That number actually changes every year. It's determined by how many streamed tracks will generate the same royalties as purchased albums. So it gets updated every year to account for changes in those rates. 2013 rates were 2000 streams to an SEA, 2014 are 1500 streams to an SEA. Thanks for that Dave. Your expert input is exactly what I was looking for, there is too much hot air and too few facts on this subject. Your illuminating explanation of 'stream equivalent albums' does open up a real can of worms as the industry is clearly not comparing like (stream equivalent albums measured by revenue) with like (track equivalent albums measured by conventional tracks). This makes it even harder to draw empirical conclusions about the relative popularity of streaming and downloads/CDs, and also makes me question my analysis of "In 2013 118 billion music tracks were accessed by paid-for streaming in the US. If a ratio of ten tracks per album is applied, this equates to 12 billion albums". Would you or any other knowledgeable reader like to make an empirical comparison between volume of streamed album equivalents measured by tracks and unit sales of downloads/CDs? Is my calculation that the volume of streamed content equates to 12 billion albums wrong? (When I wrote the post that figure of 12 billion albums seemed unbelievably high). I would say that 12B is too big. If there were 118B track streams, that's 59 million in 2013 SEA. That seems pretty low to me, but streaming is way up so far in 2014. Nielsen's mid-year report put streaming up about 42% from the first half of 2013 to the same period in 2014. In that time, both physical and download sales were down.